WUWT wonders why no mention of the Eemian at the Guardian? Eric "eugenics" Worrall has posted a "guest essay" at WUWT (archived here). Eric might be a guest at WUWT, but he didn't write any essay. What he did was copy and paste some extracts from an article at the Guardian. The article itself was a generalist piece about surface temperatures and climate models. Nothing new in it that I could see, but you may be interested. It's written by Stuart Clark and you can read it here. The inconvenient fact that sea level was around 6 metres higher during the Eemian Interglacial, and around 2 metres higher during the Holocene Optimum, 5500 years ago, was not mentioned in the Guardian article. The paper Eric linked to was published in Geology back in 1998. It looks as if Eric didn't read the paper. What it's about is a "detailed history of middle to late Holocene sea level" provided in part by an emerged coastal bench and associated fossil beach on Kapapa Island (Oahu), Hawaii. The authors are figuring out how much uplift there's been. Contrary to what Eric thought, global sea level was by no stretch of the imagination higher than it is now by two metres during the Holocene Optimum. It was higher relative to the land in Hawaii - but as discussed in the paper Eric mentioned, those islands have been rising rather than the sea falling by such a huge amount. As to the first part of Eric's question - the Eemian, yes, seas were a lot higher than today way back then. In the northern hemisphere it got hotter, too. Globally by not that much if at all. I wonder if Eric understands the implications? That if seas were a lot higher back then, it means that it doesn't take much of a rise in global temperatures to melt ice at the poles. Seas are going to rise a lot more before the next few centuries are done. It's kind of odd for Anthony to allow Eric's "guest question" through, given all his protests against rising seas. You can read the WUWT comments and a bit more by clicking the read more link. Given some of the comments, it might be worth looking at the likely global surface temperature pattern from the end of the Pleistocene through the Holocene and what's to come at the beginning of the Anthropocene (although some will argue that the Anthropocene started at the beginning of the Holocene). It's probably already as hot globally or maybe even hotter than it was in the Holocene climate optimum. The fact that sea level has been far higher in the past is no cause for complacency. On the contrary, it shows that the range of states that our planet’s climate can adopt includes many that would be rather inconvenient to a civilisation that has so far only experienced a very narrow central range of possible temperatures and sea levels, and has responded by building masses of important infrastructure within a few meters of the current sea level. I’m sure the honourable Lord Monckton would know the appropriate Latin term for this type of false logic. One study at one location does not make the sea level higher 5500 years ago all around the world. TAG says: June 14, 2014 at 7:57 am It was more than just a little warmer during the Holocene Optimum. Interglacials tend to hit their thermal peaks early on, then slide toward the next glacial more slowly. A double peak is rare, & usually shows a severe Dryas like cooling in between. Humanity cannot warm the planet enough to reach Holocene temperature & sea surface levels, even if we burnt all fossil fuels as fast as a globally growing economy could sustain. I suppose it’s the greenhouse gases in the deep ocean that are causing the warming. Good luck with that one. With flooding all but imminent, Why, why have coastal property values not declined. These poor beach-house dwellers are doomed. A consensus of government supported scientists cry shrilly of impending sea-level rise, yet the entire real estate industry is unaware. Assignment: Find cherries to pick where none exist. Report trend. This message will self destruct as soon as someone shows some warming. Grossman, Eric E., and Charles H. Fletcher. 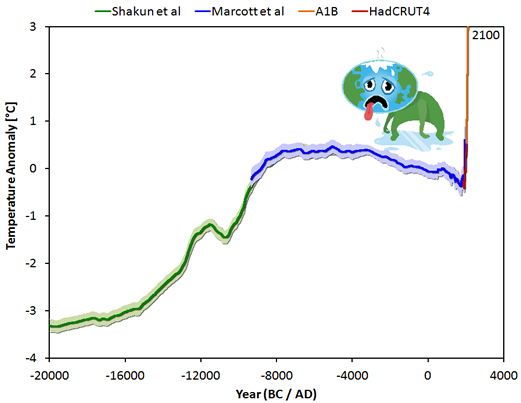 "Sea level higher than present 3500 years ago on the northern main Hawaiian Islands." Geology 26, no. 4 (1998): 363-366. You're not giving Eric enough credit. He copied a few disjointed paragraphs from the article, without ellipses. Then he pasted three comments, again without ellipses or even letting readers know that they're from the comments instead of the article. Not only that, but even after expanding all the comments I couldn't find those comments. Eric apparently pasted deleted comments as though they were written by the article's author! After nexus4684 notices this discrepency, Eric admits those paranoid insinuations (contradicted by the IPCC's 1990 statements) were actually his, not deleted Guardian comments. His "essay" has now been edited to make that clearer. "Contrary to what Eric thought, global sea level was by no stretch of the imagination higher than it is now by two metres during the Holocene Optimum." Actually, the mid-Holocene sea-level highstand in the Pacific and Indian Ocean is quite well-documented. For example, see here, here, here, and here for a nice review. Of course, this highstand has no bearing on ongoing sea-level rise. But that's not global (which IIRC didn't see that highstand), and the focus on a single site, especially one in a volcanic island chain, is still a bad error. This poor attempt at misdirection is especially ironic given multiple recent papers indicating much greater ice sheet vulnerability than had been thought to be the case as recently as a year ago. I double-checked the WG1 report, and mid-Holocene is definitely lower than present by a couple meters (with a pretty steady rising trend up to close to the present). The Eemian is shown as higher than present by an average of about 2 meters, but with a (quite brief) 6-meter high and a low about the same as present. This fast and substantial intra-Eemian ice sheet response (to Milankovitch forcing, I assume) is a strong indicator of big trouble just ahead. a strong indicator of big trouble just ahead. Inconvenient, but not in the sense that Eric Worrall has in mind. Bob, most of your comment is about sea level. Not surprisingly because it's a subject that is of great concern to everyone. However if you want to focus on the article in the Guardian rather than the article at WUWT, feel free to do so - elsewhere. BTW seas are rising. If he's still around in a few decades time even Anthony Watts won't be able to help but notice. Holocene sea level doesn't just confuse deniers, many people have a flawed perception of what happened through the Holocence, and since the last ice age. And that sea level graph by Robert Rohde at Wikipedia (last glacial maximum to present) doesn't help because it is most likely wrong. 1. Jerry Mitrovica: Current Sea Level Rise is Anomalous. We've Seen Nothing Like it for the Last 10,000 Years. 2. Sea Level Isn't Level: Ocean Siphoning, Levered Continents and the Holocene Sea Level Highstand. So for the last 4-5000 years, up until the 19th century, global sea level, i.e. the volume of water in the ocean, was unchanged. The regions closer to the equator experienced no deformation (glacial isostatic adjustment) because they were far enough away from the ice sheets, the land beneath which sprung back up when the vast ice sheets disappeared. In the near-equatorial ocean, therefore, relative sea level fell over the last 4-5000 years as ocean volume was siphoned away to fill collapsing areas of the sea floor. This 'relative' sea level fall is why the tropics are littered with '3 metre beaches', and also formed the solid reef foundations upon which atoll islanders now live. These solid reef foundations were formed when coral grew up the the higher relative sea level, and were left exposed as sea level there fell over the last 4-5000 years. Thanks, Rob. They are great articles and an excellent video (first link), which I've posted at HW at other times too.